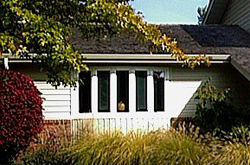 State-of-the-art composite windows from ABC Seamless can help lower your energy bills and keep the inside of your home more comfortable throughout the year. The windows we sell and install are made with polymer composites, which are more energy efficient than aluminum, wood, or vinyl and can lead to savings on your heating and cooling bills. These polymer composite windows do much more than help save energy – they also are 400 percent stronger than typical vinyl windows, making our composite windows the perfect choice for withstanding high winds and heavy rain. Plus, our composite windows resist rot, warping, and cracking, making them the maintenance-free alternative to wood, vinyl, and aluminum windows. You’ll also receive an outstanding, 50-year transferable warranty on all of our composite windows. In addition to installing durable, energy-saving replacement windows, we are a siding contractor that installs beautiful, seamless residential siding, soffits and fascia, and more. Plus, we’re a roofing contractor that installs durable, energy-efficient roofs that can save on heating and cooling costs and can help to complete the look of your home. Our commitment to providing superior workmanship has helped us to earn a Top 500 rating from Qualified Remodeler as well as an A+ rating by the Better Business Bureau. To learn more about composite windows for Omaha, Hastings, Kearney, and all surrounding communities, contact ABC Seamless today.